The uncontrolled, destructive re-entry of a Soyuz rocket stage that helped boost a three-man crew into orbit earlier this week was seen from the Mediterranean region in the early hours of Sunday per reports and videos coming from the French Riviera and Central Italy – indicating the 6.7-meter long rocket body met its end over the Mediterranean Sea, supported by data from the U.S. Joint Space Operations Center. 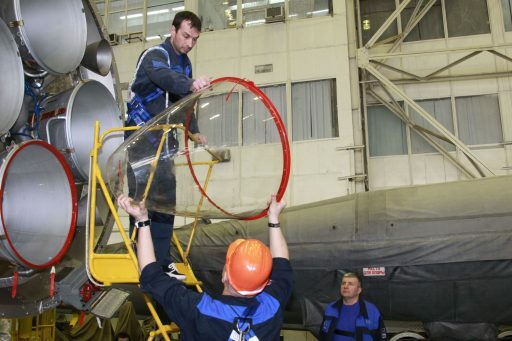 Soyuz rocket stages re-entering the atmosphere have been an often-spotted sight in recent years, in part due to the launch rate of the Russian workhorse and the fact that most Soyuz third stages end up in fairly short-lived orbits, re-entering within a period of days. In the last three years, Soyuz stages surprised observers in Newfoundland, Las Vegas and New Zealand. Night owls around the Mediterranean received a similar show in the night to Sunday, just after clocks shifted to Daylight Saving Time across Europe. The Soyuz FG rocket lifted off from Kazakhstan’s Baikonur Cosmodrome at 17:44 UTC on Wednesday, March 21st, carrying into orbit the Soyuz MS-08 spacecraft headed to the International Space Station with veteran Cosmonaut Oleg Artemyev and NASA Flight Engineers Drew Feustel and Ricky Arnold. 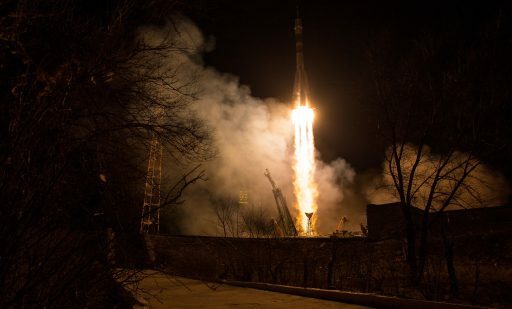 Blasting off from the remote launch site, Soyuz dropped its four boosters two minutes after taking flight and shed its large central core before hitting the five-minute mark, handing off to the Block I third stage for the final push into orbit. Soyuz MS-08 separated from the Block I eight minutes and 48 seconds after liftoff, later climbing up toward the Space Station while the spent third stage remained in the relatively low injection orbit. Soyuz MS-08 lifted itself into a 400-Kilometer orbit where it linked up with the International Space Station on Friday to top up the Expedition 55 crew at its full complement of six members. 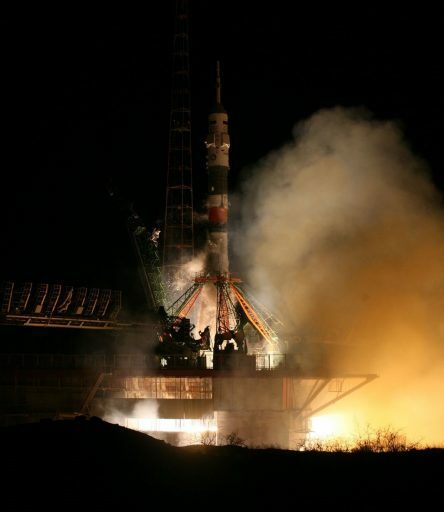 While the three Soyuz kicked off their stay of 158 days, the rocket stage that had helped them into orbit was approaching the fiery end of its life as it descended toward the dense layers of Earth’s atmosphere. The 2,410-Kilogram Block I started out in an orbit of 191 by 222 Kilometers, inclined 51.64 degrees, according to tracking data from the Joint Space Operations Center that monitors all sizeable space objects in orbit through ground-based radar and optical tracking. At an altitude of 200 Kilometers, objects experience a fair amount of drag in the form of collisions with a mix of atoms, ions and molecules present in the upper atmosphere at a density that varies greatly depending on solar activity. Typically, Soyuz stages from ISS launches last between two and five days – depending on their initial orbit and state of the atmosphere. Interacting with particles in the lower thermosphere, the Block I stage began losing altitude at a swift rate and drag acting on the mostly hollow rocket body continued rising as it headed toward the mesosphere ahead of its final dive into the upper stratosphere where most of the rocket’s structure was expected to be incinerated without reaching the ground. 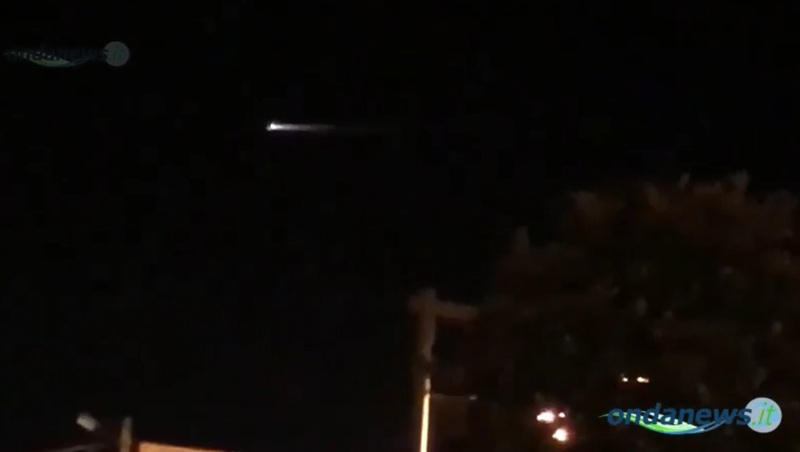 Reports of a bright phenomenon crossing the sky emerged on Sunday in Italian and French press outlets and dozens of posts on Social Media reported a bright object streaking across the sky over the French Riviera, Tuscany and Southern Italy at 3:30 a.m. local time (1:30 UTC). 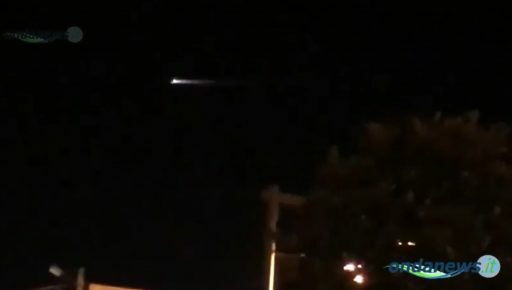 Sensationalized reports spoke of ‘panic’ in the streets of Latina and tied the phenomenon to the Chinese Tiangong-1 space laboratory that is due to re-enter in the coming days and will likely be the most-watched re-entry event of the year. 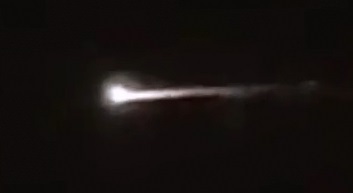 Videos posted on YouTube from a number of locations show the typical appearance of an artificial space object: the characteristic low speed, fragmentation into a number of glowing pieces, a long debris and plasma tail, and the longevity of the event – visible for over half a minute from most observation locations. The Joint Space Operations Center pin-pointed the re-entry of the Block I upper stage at 01:25 UTC ±1 minute – a two-minute entry window centered on 41.9°N and 8.1°E. This data was obtained through the U.S. Missile Early Warning architecture comprising several sharp-eyed infrared-sensing satellites in Geostationary Orbit to detect the infrared signature of missile launches. Their infrared vision also allows them to track the IR emissions from sizeable space objects entering the atmosphere – providing a definitive location and time within a narrow window. 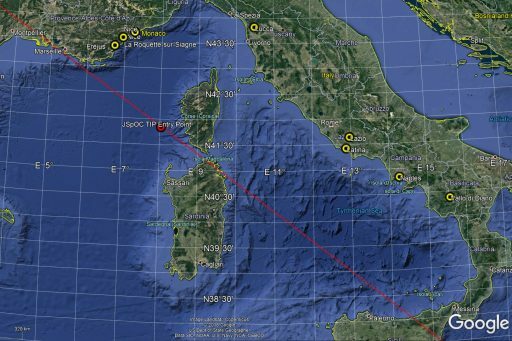 In the final minutes of its flight, the rocket stage was headed from north west to south east, crossing over southern France from Île d’Oléron to Marseille before flying over the Mediterranean Sea, crossing right between the islands of Corsica and Sardinia. 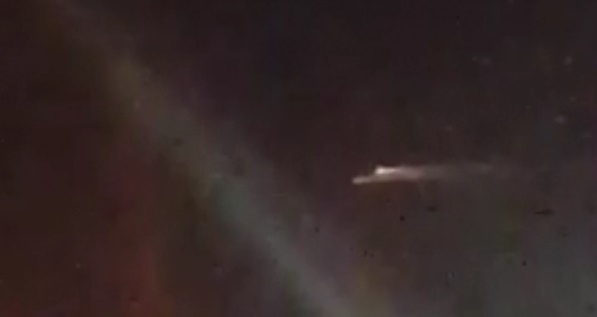 The re-entry time referenced by JSpOC corresponds to Block I passing 80 Kilometers in altitude where the object is immersed in plasma and typically begins breaking apart as the result of drag building up to a destructive force. With a two-minute window of uncertainty, this could have occurred anywhere from Montpellier to a point 150 Kilometers north of the Island of Sicily. The Block I third stage of the Soyuz is 6.74 meters long and 2.66 meters in diameter, holding nearly 23 metric tons of propellant at launch, expended during a four-minute burn by its 297.9-Kilonewton RD-0110 engine with four combustion chambers and nozzles, assisted by four gimbaling verniers for steering. 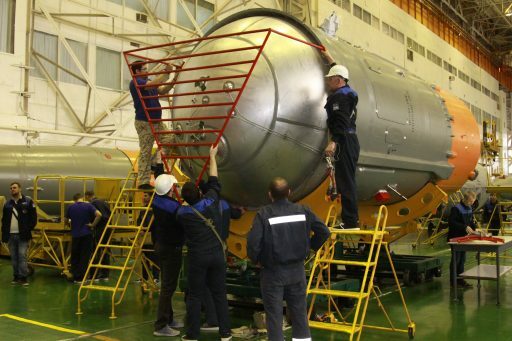 Starting its final dive, the rocket stage would have become visible around 104 Kilometers in altitude when plasma began building up around its structure. The shock wave layer forming just in front of the spacecraft and any separated components leads to considerable heating that causes the incineration of the majority of the spacecraft structure between 50 and 70 Kilometers in altitude. Temperatures reached during re-entry can melt most metal types used on the spacecraft and most of the fragments created on entry fully burn up, leaving a cloud of dust in the upper atmosphere. 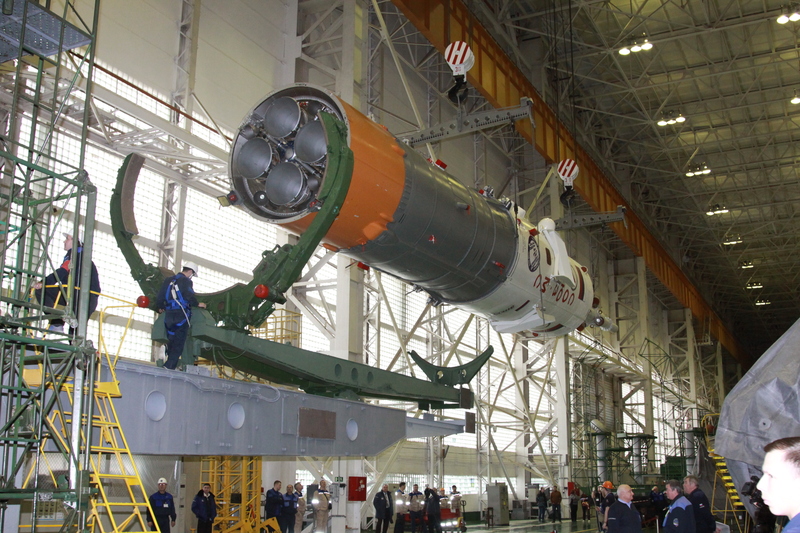 The majority of the rocket’s structure was expected to burn up in the atmosphere; however, SL-4 rocket stages contain a number of dense components that can survive the entry process and reach the ground, including some of the heavier engine components like turbopump shafts as well as pressurant tanks. Dense components that survive re-entry usually impact 800 to 1,300 Kilometers downrange from the Orbital Decay Point and are strongly influenced by winds in the lower atmosphere. Based on the decay point determined by JSpOC and the available observer reports, any surviving debris of the rocket stage likely impacted in the Mediterranean Sea south east of Sicily.